LEAVING St. Mary's, we arrive at The Pavement, once a favourite residential street for the gentry of the neighbourhood. Many of these "Town Houses," though still existent, are converted into offices or warehouses. The large, stone building with pillared portico, is the Shire Hall, containing the Assize Courts. The stone building, in course of erection, is for the accommodation of the various County Departments, Police, etc. An old house, on the opposite side of the road, is known as the Judge's Lodgings. The very fine, stone, Gothic building, with graceful spire cleaving the air, is the High Pavement Unitarian Church. Its origin (although the present building is only about thirty years old), goes back to the far off days when, in consequence of Charles II. 's Act of Uniformity, 1662, many Presbyterian divines resigned, or were deprived of their position in Anglican churches. Among these were the Revs. John Whitlock, M.A., and William Reynolds, M.A., Ministers of St. Mary's, and the Rev. John Barrett, B.A., Minister of St. Peter's. The trio, true to their principles amid protracted hardship, afterwards became associated in the Pastorate of the first Presbyterian Chapel on this site in 1690-1. After about 1735, the'doctrines of the Church gradually became Unitarian. In the open space where Weekday Cross used to stand is a warehouse, with a tablet stating that Philip James Bailey, the poet, was born in a house occupying the same site. The Old Town Hall overlooked this space until 1897, when it was removed to make way for the Great Central Railway. At the juncture of Low and Middle Pavements is a very quaint old Inn, The Postern Gate, marking the site of a Postern in the Town Wall, traces of which were met with near Thurland Street, when the above railway was in making. Looking to the left down the busy street crossing the end of The Pavement, is seen a Gothic Eleanor Cross and drinking fountain. This was erected in 1866, in memory of a member of the Walter Family (Proprietors of the Times), who sat in Parliament for Nottingham. The Cross fittingly marks the head of Greyfriar Gate, called after the Grey Friars already alluded to (p. 64). Castle Gate Congregational Church occupies an excellent site near the bottom of The Pavement. The extensive block of buildings includes the handsome and commodious church, a lecture hall, and various class rooms, and was erected in 1863, from designs by Mr. Sutton. Nottinghamshire has seen some thrilling scenes in the history of Nonconformity. At Scrooby, in the northern part of the county, was formed the first Independent Congregation in the country, whose leader was John Robinson, M.A., of Corpus Christi College, Cambridge, called the "Father of English Independency." * After a sojourn at Leyden, in Holland, the Scrooby Church, now known as the "Pilgrim Fathers," sailed in the "Mayflower," from Southampton for Plymouth Rock (1620), and so founded the second English Colony in America. There is documentary evidence that a Church first gathered together in Nottingham in 1655, and a permanent meeting house was erected in Castle Gate, 1689, after the Toleration Act of William and Mary came into operation. This old building, variously altered, stood for over 170 years. An incident, worthy of record, is that in 1728 the great Philip Doddridge (afterwards Dr.) was approached at the same time both by "Castle Gate"and "High Pavement," and decided—as a man wooed by two "fair charmers" at once is bound to do—to accept neither. In Park Street, a continuation of Friar Lane, there still stands the oldest Baptist Chapel in the town (erected 1724+), now used as an old curiosity shop. Still older is the Burial Ground in Mount Street, long disused. A tablet on the old Chapel informs us that within its walls, in 1792, William Carey, D.D., preached his great missionary sermon. The fine Gothic Church on Derby Road, with its excellent schools and class rooms on the same site, was opened 1850. The General Baptists are first heard of in 1773. In 1782 they purchased the old Methodist Chapel—the Octagon—and shortly after­wards (1799) the Chapel in Stoney Street was built. A short distance along Castle Gate brings us to a quaint brick building which is the Parish Church of St. Nicholas, one of the three original parishes of Nottingham, the other two being St. Mary's (which now has about a score of daughter churches) and St. Peter's. The present post-Reformation Church, which we are bound to say, as a building, does not offer many points of interest, was erected in 1678, to replace the original one destroyed by Colonel Hutchinson, Governor of the Castle during the Great Civil War. "The Steeple (of the Church) so commanded the platform (of the Castle) that the men could not play the ordnance without wool sacks before them. From this church the bullets played so thick into the outward Castle yard, that they could not pass from one gate to another, nor relieve the guards, but with very great hazard. "* Having driven the Newarkers (i.e. the King's party) out of the town, the Colonel ordered the demolition of the church to avoid a return to such tactics. St. Peter's, also known as SS. Peter and Paul. We may take a passage opposite St. Nicholas', at each corner of which is an old Inn (the "Salutation Inn" should be particularly noticed), then turning to the right, along Hound's Gate, we come in sight of the ancient battlemented tower and spire of St. Peter's. The church is entered by the north Dorch, and is well worth a visit. The tracery of the windows is for the most part of Perpendicular style, fifteenth century. The clerestory is lit by curious round-headed openings. The oak roof of the nave is coeval with the greater part of the church. The south arcade presents some interesting Early English columns, with "grotesque" and "conventional" capitals. The caps, of the north arcade are a puzzle to antiquaries, having a moulding cut in the form of a "battlement" (chipped off in places to make room for a now defunct "loft" or gallery). The handsome rood-screen, with figures of St. Mary and St. John and the Apostles, and the choir stalls were given in 1898 by Mr. Wm. Gibson. The chancel was rebuilt and many other improvements made by the late Rector, Rev. George Edgcome, M.A. Overlooking St. Peter's is a building with Doric portico, which has done this town good service for municipal purposes, and now accommodates the Water and City Accountant's Offices. A short walk along Wheeler Gate, passing Friar Lane already alluded to (p. 64), then through the Market Place and Chapel Bar, will bring us to St. Barnabas' Roman Catholic Cathedral. If time presses we may take a Bulwell tram from St. Peter's to the entrance. This large assemblage of buildings was designed by Pugin, and consecrated in 1844. It comprises besides the cathedral, a clergy house, convent for Sisters, schools, and a block of houses and shops. The church is of Early English design, cruciform, with central spire rising 150 feet. The walls inside are artistically decorated in colour, and there is a fine set of Stations of the Cross. The high altar and reredos should be noticed. In the choir ambulatory are the Lady Chapel, and other chapels dedicated to Saints (St. Thomas of Canterbury, the Venerable Bede, etc.). The chapel of the Blessed Sacrament (on the south) will be recognised by the lamp always kept burning. Turning towards the market, we come to a short, narrow street, Chapel Bar, at the head of which stood a Gate in the old town wall. Our route is along Park Row, once the Town Ditch, and we may fancy the wall running up beside us on the other side. On our right is a building with imposing stone front—St. Thomas' Anglican Church, which, having been built by a Nonconformist, Mr. Mercer, was acquired in 1874. The church is always open, and contains a handsome rood-screen and some stained windows. The walls are tastefully decorated. At the top of a steep hill we come to Postern Street, marking another opening in the wall, which here make a sharp bend in the direction of the Castle. This large building is entered from the top of Park Row. Originally built in 1782, it has many times undergone enlargement, and now accommodates nearly 250 patients. The Round Tower, forming the Jubilee Wing, was erected 1897, to commemorate the Diamond Jubilee, and the whole building has recently been enlarged and modernised. The latest addition is the new Out-Patient Department, built at the expense of Col. Sir Charles Seely, Bart.— only one of many of this kind donor's generous deeds. St. James' Church, is on Standard Hill, a continuation of Postern Street. Built in 1809, it is the first church building erected by the Establishment in this town since the Reformation (St. Nicholas' was an act of rebuilding, not a new foundation). The church is roomy and well-appointed inside, though bad architecturally. St. James' Street, opposite the church, is not called after it, for it existed before the present edifice was thought of. 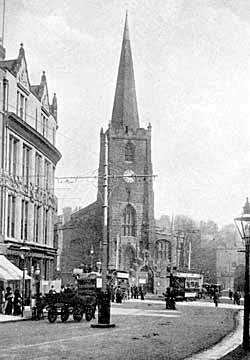 The street derived its name from a former chapel of St. James', the site of which is now lost. * See Early Annals of St. Andrew's Presbyterian Church, by J.C.G. * See History of Castle Gate Congregational Church, 1655—1905, by Rev. A. R. Henderson. 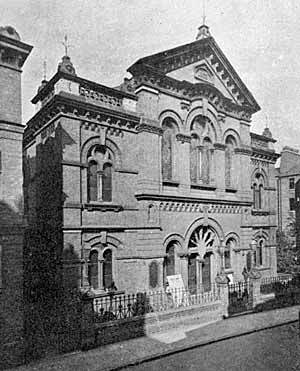 + Earlier than this (date uncertain) according to The History of Friar Lane Baptist Church, by J. T. Godfrey and J. Ward. * Life of Colonel Hutchinson.